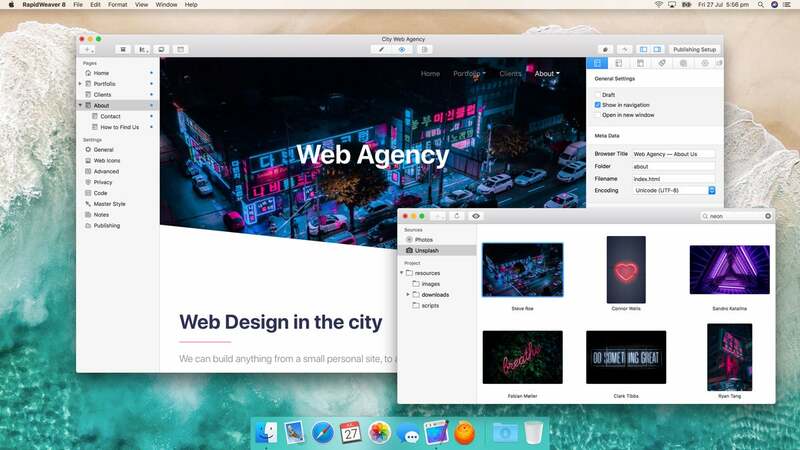 A powerful, easy to use web design application for Mac that enables anyone to build beautiful, responsive websites without having to write a single line of HTML code. Realmac Software’s RapidWeaver is a WYSIWYG (“what you see is what you get”) website development application designed to do most of the heavy lifting for you. Its easy-to-modify templates make it a snap to create a modern, custom website designs though the comfort of a user interface that feels like one that came straight out of Cupertino. WYSIWYG web apps aren’t as novel as they once were-online services like Wix offer to do the same thing for free or dirt cheap, often bundled with bargain-priced web hosting. And to be fair, even the latest version of RapidWeaver will get you only so far on its own, which is why Realmac continues to foster a community chock full of add-ons including themes, plugins, and stacks that users can purchase to accomplish more advanced tasks the host software alone can’t handle. 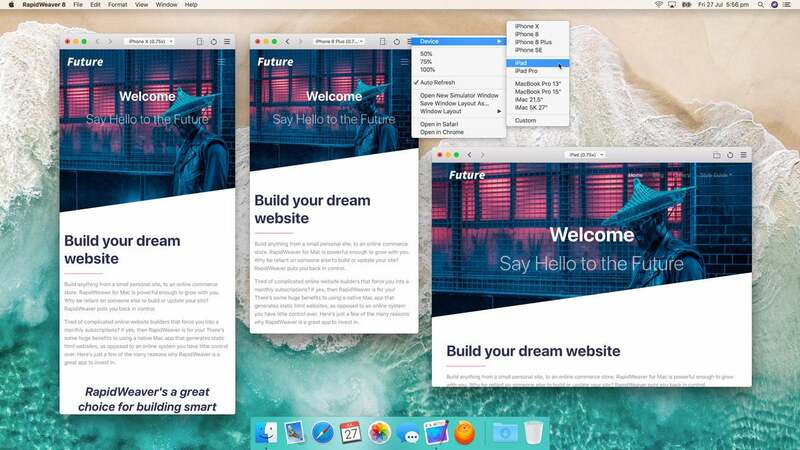 RapidWeaver 8 plugs up a few holes in the application’s feature arsenal, starting with a device simulator to preview how sites should look on ten different iPhone, iPad, and Mac models in portrait or landscape mode, all in real-time as changes are being made. The simulator isn’t as comprehensive as the one in Adobe Dreamweaver, but there’s an option that allows designers to drag windows to a desired size and save those custom dimensions as other devices. You can even position multiple layouts side by side on the screen and RW8 will remember them next time a project is opened. The new device simulator mode updates in real-time as changes are made, but it's still now quite a replacement for true WYSIWYG editing. The simulator isn’t the only area of the application where you can restore the previous window state. This feature works across all open windows, so your preferred layout applies to every future project (that is, until you change it again). This is a solid step in the right direction and welcome addition to be sure, but I’d love to have the ability to save window states on a project by project basis, rather than as a single universal setting. RapidWeaver 8 offers five new built-in themes, bringing the total number to 61. By checking Generate Social Tags under Settings > General in the sidebar, web designers can now make sure proper meta tags are written for both Twitter cards as well as Open Graph. This functionality also extends to individual blog posts by modifying the Social Tags section for each entry. Although unfamiliar with royalty-free stock photo service Unsplash prior to upgrading, the new integration in RW8 has made me a fan. In addition to importing images from your Photos library or other resources, users can now simply select the service from sources, type in a search query, then drag the desired content into your project. There’s no account or signup necessary, and images are stylish and high-quality; you can also visit the author’s page or add images to your resources for later use right from the contextual menu. Want to spice up your website with stylish, high-quality images? RapidWeaver 8 now integrates directly with royalty-free stock photo library Unsplash. Another convenient feature is the web icon generator, which allows users to drag and drop a single PNG graphic, then generate all of the necessary size variations in a single click. The only exception is a Safari pinned tab, which requires an SVG image, as well as choosing the desired theme color. It’s an extra step, but far more streamlined than with previous releases. For all of its many advantages, RapidWeaver 8 doesn’t address a few longstanding criticisms. Although the new simulator eases some of the suffering, edit mode still isn’t WYSIWYG, requiring a lot of hopping into preview mode to see the results. Also, Realmac relies too much on third-party addons like Stacks ($50), so users wind up paying more for advanced features. A handful of new features like RapidWeaver 8’s simulator mode, saved window state, and Unsplash integration make this a worthwhile upgrade for users ready to move on to something more robust than online web services.